Sometimes FlipShare doesn’t work the way you expect it to, but you need to know how to make the Flip Video camera program work for you. You can customize the Flip software’s settings by changing the Preferences. To view and adjust FlipShare’s preferences settings, choose Edit, Preferences (Windows), or FlipShare, Preferences (Mac), to display the FlipShare Preferences window. The FlipShare Preferences window contains some or all of the tabs described in the following. Simply click a tab to change the settings options displayed on it. 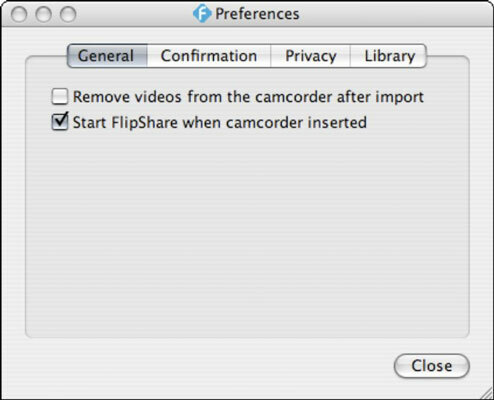 Start FlipShare When Camcorder Inserted: Clear this option if you don’t want FlipShare to automatically run when you plug your Flip camera into one of your computer’s USB ports. Ask Me About Saving Preferences Each Time: Select this option if you want FlipShare to prompt you with the following choices whenever you copy video files from your Flip to your computer’s hard drive. Automatically Save Videos from the Camcorder: Copies video files from your Flip to your computer’s hard drive whenever you choose the Save to Computer option. Remove Videos from Camcorder After Saving: Automatically deletes video files from your Flip after copying them to your computer, thus freeing up memory space on your Flip so you can shoot and save more videos. 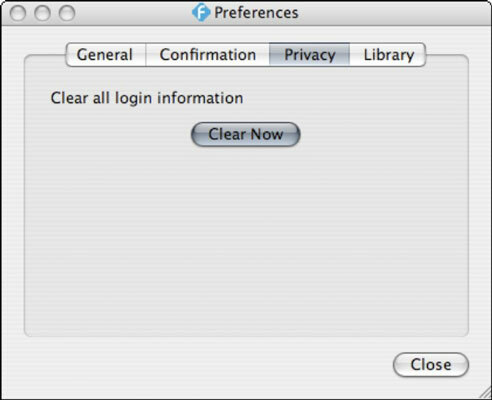 Click the Clear Now button to wipe out your login username and password information. On this tab, you can enable or disable Windows XP or Windows 7/Windows Vista visual enhancement settings that can affect how smoothly FlipShare plays videos you watch when using the program. Clearing either check box (based on which Windows operating system you use) can improve how smoothly videos play in FlipShare on slower or lower-powered systems. If you have a super-fast Windows PC, you won’t notice much or any difference if the options are unchecked. Note: The Advanced tab appears only on the Windows Preferences window, and not on the Mac Preferences window. Here, you can find information about the size and location of your FlipShare Library, which is the folder containing all your FlipShare video and picture clips and any other files necessary to keep track of your FlipShare Library. You can also move the location of the Library. Click the Change Location button to choose a different location on your computer’s hard drive to store your FlipShare Library folder. Choosing an external hard drive instead of your computer’s built-in hard drive is one way to provide more storage space for copying and working with the many files in your FlipShare Library.